What a blessed Christmas Sulmi and I had! From moment to moment my heart was full of gratefulness. I want to share this overflowing with you. We began with a short Christmas liturgy from Wellspring.org called "The Gift of Light." We took turns reading the prayer and scripture verses and then we prayed that this light of God's love would shine out from us so that out lives bear witness to the radiant love of God. It was a good beginning to a wonderful day. 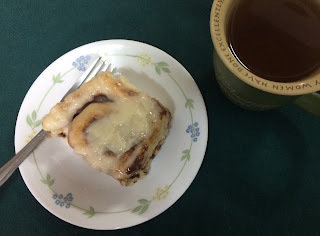 For breakfast we ate a cinnamon roll, ohhh guilty pleasure. Sulmi and I made them the night before. I thought of my sister Julie because we, too, had stayed up making cinnamon rolls one Christmas eve. Adoncia liked the wrapping paper. On to presents. We just had a few. We have so much and don't need a lot. We were glad to keep the giving simple. Even Sulmi said she doesn't need or want anything. I gave her new pants and the chance to pick shoes from our friend's book. I also gave her some little cosmetics, She is maturing to that stage when girls like to try make-up on. She knows I don't use make-up, but needs to choose for herself. I can't forbid it. I think she will come out on a balanced side of the issue. Kristel joined us about 2:30. Her mother asked me to keep her for Christmas because Camy was in Punta Gorda, Belize with her ailing mother. Kristel's brother invited her to San Pedro and then sent her on a small plane back to Orange Walk. When Kristel arrived, we ate. Sulmi asked me to make beets like a friend Barb Romero had made for us at Thanksgiving. I tried, they were better at Barb's. The rest of the food was a re-enactment of Thanksgiving. Sulmi helped prepare it with me. She likes to cook and I always enjoy cooking with her. Notice that she is wearing a dress? While I finished cooking she disappeared into her room and came out in a dress and nice shoes (and a touch of make-up). I asked her why she got dressed up and she said, "Because it's Christmas!" Ok, so I changed, too. Every year we have always spent Christmas afternoon with Sulmi's birth family in Yo Creek. We pass out gifts to the children (usually their only gift.). 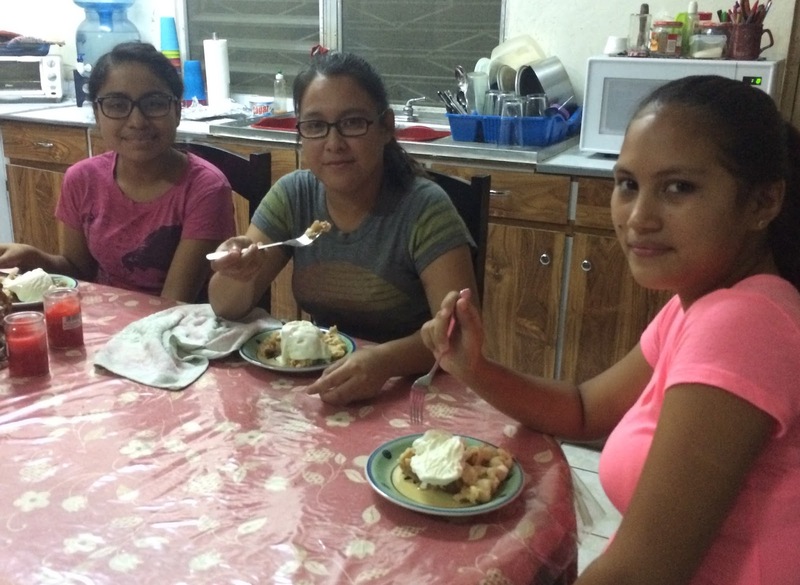 There are ten children in her family, but we also share with her Aunt Isabela's family and all of the adults. Izzy is the one Sulmi stays with if she goes to visit. It's a blessing to be able to see the children light up with excitement. Below you will see several pictures from our time at Izzy's house with Sulmi's whole family. You'll see Elizanie in the picture. She called and asked if we could pick her up and let her join us. So with her mom's permission Elizanie joined Kristel, Sulmi and me for the rest of our Christmas day and night. Sulmi's father is holding their 6 month old baby. This is Aunt Isabela opening her gift with Sulmi's sisters looking on..
Sulmi, her Dad, and her uncle who takes care of two of the children, and Elizanie. Sulmi and her birth mom. Sulmi working her magic on the baby. Little Orlando loving his new toy. When we got home we ate leftovers and put together a new puzzle. As I write this on Boxing Day, they are still working on the puzzle for over two hours with lots of companionable talk in between. We ate our homemade apple pie and the girls lounged with facebook while I watched "When Calls the Heart-Christmas" a new Hallmark movie. Ahh what a relaxing end to a perfect day. That sounds like a really wonderful day! Blessings to you.